Losing bell fat can present quite the challenge. As you age, your metabolism begins to slow, making it harder for you to lose weight -- including belly fat. At the age of 50, you will need to engage in regular diet and exercise to lose belly fat. You cannot specifically target fat loss to just your belly, but you can lose the weight everywhere and tone your stomach. Consult your doctor. The National Academy of Sports Medicine -- NASM -- indicates individuals over the age of 40 should receive a physical exam prior to beginning a new diet or exercise program. Burn calories by engaging in regular cardiovascular exercise. NASM recommends individuals looking to burn fat engage in 60 to 90 minutes of exercise, five days per week. Choose one or a variety of cardiovascular exercises to help burn calories. 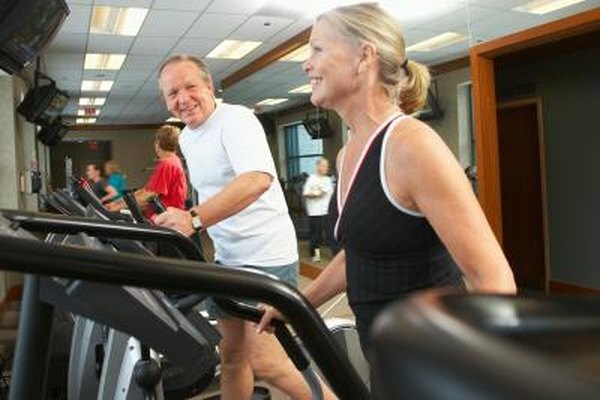 Consider swimming, cycling, walking, jogging, aerobics, sports, dancing, gardening or using an elliptical machine. Engage in light strength training to help tone your abdominal muscles as you begin to lose fat. This can help give your belly a firmer, more toned appearance. Perform situps, pushups, crunches, reverse crunches, bicycles, side bends, squats and lunges. Complete each exercise in one set of 15 repetitions, twice a week. Eat a healthy, well-balanced die full of fruits, vegetables, lean meats, low-fat dairy and whole grains. Drink at least eight glasses of water per day. Water can help hydrate your muscles and keep you feeling fuller throughout the day. Reduce your calories by 500 calories per day. This can amount to 1 pound of fat lose per week. Replace soda with water, skip alcohol beverages, and replace a high-calorie dessert with a serving of fruit. Take extra steps throughout the day. Burn calories by walking the stairs opposed to the elevator or parking farther away from a building and walking. Listen to your body. If something does not feel right, stop exercising and rest. If pain or symptoms persist, contact your doctor. For shortness of breath, chest pain and dizziness, get immediate medical attention.